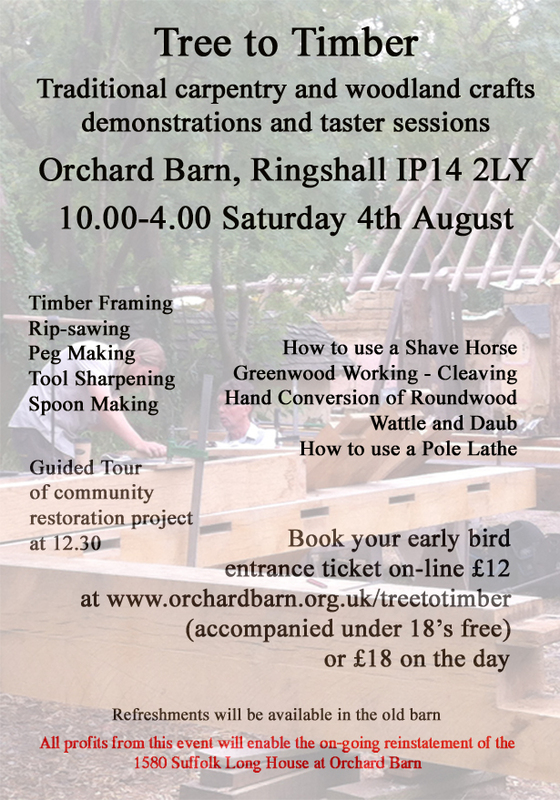 Come and spend a day at Orchard Barn. We are in rolling countryside in mid Suffolk, IP14 2LY. Our off-grid teaching centre is a beautiful 17th century timber frame barn that has been authentically restored by trainees and volunteers using traditional techniques and locally sourced trees and earth. Around the site there will be Tree to Timber demonstrations and taster sessions in traditional carpentry and woodland crafts. At 12.30 there will be a guided tour of the old barn and our next project - the reinstatement of a ruined 1580 Long House adjacent to Orchard Barn. Refreshments will be available, or you might like to bring a picnic and enjoy the old orchard. Help OBee Community Interest Company mark their 12th year. Please cycle, walk or car share. Supervised children welcome, but please note there will be sharp tools in use, and the site is not a playground. Watch our Youtube video that features some of the demonstrations and tasters session at Tree to Timber 2017. The video also looks at the current project and our need for sponsorship. If you can help, please email Sarah.